Perfect gift for the wine enthusiast. A great way to break the ice when meeting new friends. 1.Sit the wine bottle opener over the bottle. 4.When wings rise to proper height, press both wings down to extract the cork. COMBINING FUNCTION AND STYLE - Classic two arm 'butterfly design' wing corkscrew wine opener. Also functions as a bottle cap opener. Essential accessory for your personal wine collection. The same great as a exquisite gift to the companion's wine lovers. 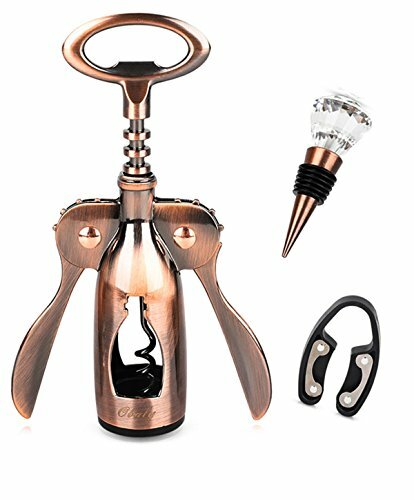 PACKED WITH ACCESSORIES - Beautifully designed, the wine bottle opener corkscrew set is generously accessorized for your optimal convenience. It includes a handy magnetic foil cutter, to easily remove foil and leave a smooth edge and clean bottle top; wine bottle stopper has a soft rubber gasket for a firm fit with crystal decoration of modern appearance design. HELPS KEEP CORK PIECES OUT OF YOUR WINE. Smooth lever action helps prevent damage to the cork done by the twisting of traditional corkscrews. Works on natural corks, composite corks, and synthetic corks. UNIQUE WINE GIFT IDEA - Packaged in a classy cognac-color, there's nothing like it for a wedding, anniversary, birthday or housewarming gift. Makes a great offering for the host of your next dinner party - with or without a bottle of wine in tow. If you have any questions about this product by OBALY, contact us by completing and submitting the form below. If you are looking for a specif part number, please include it with your message.